5 Incredibly Romantic Things To Do In Bali On Your Honeymoon! The wedding season is fast approaching, and by now, the wedding checklist has been prepared and things are just starting to turn a little chaotic. The wedding date is set, the perfect venues are chosen, the guest list is increasing with each passing day. (And if you are among the first to wed in your family, God bless your soul!). Indian weddings can be a grand affair, we all know it. But in this state of planning the perfect wedding, have you pushed your honeymoon planning into the background? Fear not, we’ve heard your SOS even with all that wedding chaos! We suggest you book your flight tickets to the paradise of Bali, for one simple reason: It is your dream holiday that fits right into your tight wallet. (i) By taking them on a romantic walk along the turquoise beaches of Bali. 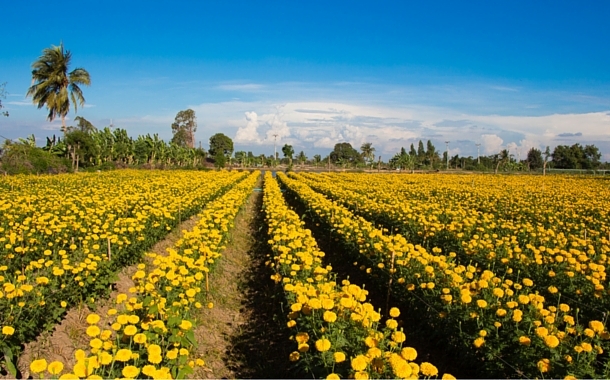 Like the legendary shot that was taken in the golden fields of Punjab in the movie Dilwale Dulhaniya Le Jayenge (DDLJ); recreate the same with your sweetheart in a field filled with marigolds in Desa Belok, Bali. This is your one chance to make your social media followers green with envy! Getting there: After an approx 15 minute drive from Bedugul to Kintamani; lo and behold- Marigold fields are right by the roadside! Would you settle only for a candle lit dinner when you could bask in the warmth of a hundred more? At Swept Away,The Samaya in Ubud, the evening comes alive with a 100 candle dinner service, while your table for two is on the river! Swept Away, already? 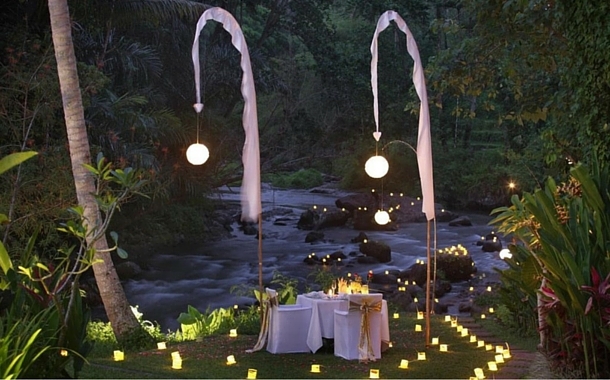 Address: Swept Away, The Samaya , Banjur Baung, Desa Sayan, Ubud, Bali..
Price: approx $60 per person. 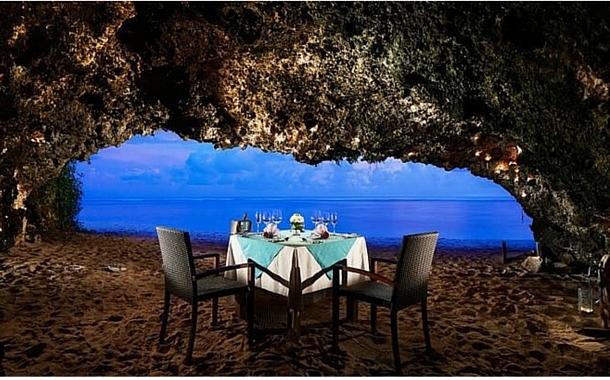 A five course menu in a neatly tucked away cave, while you are surrounded with scented candles, and in front of you lies a blue private beach. Would you ask for anything more? We sure wouldn’t! Address: Jl Pura Barong – Barong Sawangan, Nusa Dua Seletan 80363, Bali, Indonesia. There is something about waterfalls in general, but what about a waterfall that is a combination of many? While natural water cascades down heights, you and your partner stand witness to the glories of multiple waterfalls. 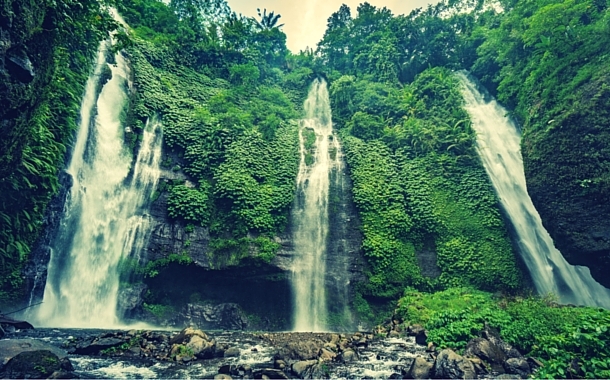 Getting There: To get to the Sekumpul Waterfall, travel from Denpasar to the Singaraja region and from there on, to the village of Sekumpul. The drive takes around 2 hours, and is marked with proper signage. Price: No entrance fee, $10 dollars per baby turtle adoption. Besides this, if you require any further assistance while planning your special holiday, do connect with us on Facebook or Twitter! 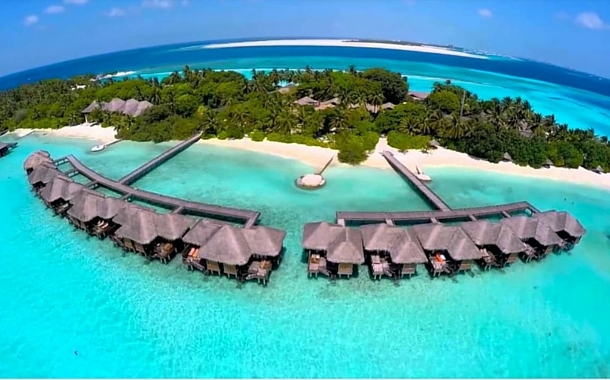 Check out the top exclusive honeymoon packages here at Musafir.com.